Prolific copper and arsenic mines in South Devon. Now forms part of the UNESCO World Heritage Site for the mining landscape of Cornwall and Devon, designated in July 2006. At its peak, in the latter part of the 19th C, Devon Great Consols was both the largest copper and arsenic producer in the world and was at the cutting edge of ore-recovery technology. When they were first worked in 1844, because the land was leased from the Duke of Bedford, they were known as the North Bedford mines, or Wheal Maria. In 1846 the Devonshire Great Consolidated Copper Mining Company was formed to work the site. A 4-mile (7.5 km) narrow-gauge railway was opened in 1859, linking the mine with Morwellham Quay for the export of ores. It contoured the high ridge from Devon Great Consols Mine and descended to the Quays via an inclined plane that connected directly with Morwellham’s Great Dock. 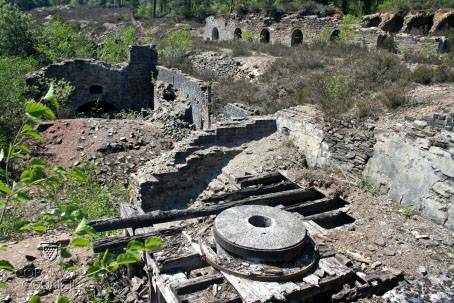 The mines ceased production in 1901 and were abandoned in 1903, but had some reworkings, the latest being in the 1970s. Throughout the 20th Century the mines were worked, on a much smaller scale, for a number of minerals including copper, arsenic, tin and wolfram. The land around this whole area is still heavily contaminated - so do be careful! Around 25km of brand new trails have been created as part of the Tamar Valley Mining Heritage Project. There are 8 trails available for a range of activities including walking, cycling and horse riding. HERE! is the leaflet you need to download to get all the walking information for Devon Great Consols! Read the research papers by The Tamar Valley Industrial Archaeology Society HERE! I recommend using the Tamar Trails Centre as your base! Please follow the link HERE! to take the short visitor survey. The results are anonymous and to be used in a heritage management report for a masters degree.